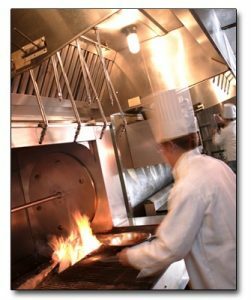 Restaurant hood suppression systems can help stop fires in your restaurant’s kitchen. Here is some more information about them. When you’re running a restaurant, you make to make sure that your kitchen is as efficient as possible. However, that efficiency can’t come at the cost of proper fire safety. Restaurant hood suppression systems can help stop fires in your restaurant’s kitchen. Here is some more information about them. There are multiple brands of restaurant hood suppression systems. As with other appliances, these brands all offer something different. That said, they still have some features in common. The suppression system that is the backbone of the appliance attaches to the hood and the gas line serving the range. When the suppression system activates, it cuts off the flow of gas to the stove. However, even if this method stops a gas fire, it might not stop a grease fire. That’s why these systems have secondary extinguishers built into them to deal with grease fires and stop them from spreading into the rest of your kitchen. This secondary fire extinguishing element is the nozzle or nozzles built into the hood. These nozzles will dispense a specially-formulated suppression agent that is a mixture of water of chemicals in it. Although water is ineffective against grease fires, this mixture also has an additive that can put out a grease fire. Then the hood turns on and eliminates the leftover smoke from the flames. As implied by their name, restaurant hood suppression systems are most commonly found in restaurants. However, they can be used in any type of commercial kitchens, such as the ones found in sports stadiums, movie theaters, and grocery stores. They are also immensely useful in the busy kitchens of fast food restaurants. These systems are crucial because they can protect restaurant employees from fires and allow them to continue working without needing to shut down the kitchen entirely. There are differently-sized restaurant hood suppression systems. You will need to find the one that is the best fit for your establishment. Speak with the system technicians to determine how the systems should be incorporated into your kitchen, and consult with your fire protection partner on if the kitchen needs to be redesigned to accommodate more of these systems. This entry was posted on Thursday, October 18th, 2018 at 4:04 pm. Both comments and pings are currently closed.